With yesterday’s release of the Labour Party’s Manifesto, the run-up to the General Election is truly underway. Finally the parties are laying out their stalls in the light of day and we all know where everyone stands – well, sort of. Having listened to Ed Balls discussing his party’s economic policies on Radio 4’s Today programme yesterday morning, I’m more confused about what they are planning to do than I was before. As James Naughtie found once again, getting a straight answer out of a politician is like drawing blood from a stone, even on the day they publish an 86-page document spelling out their plans in black, white and red. Still, it does contain lots of well-taken pictures of happy people who obviously think that Labour would do a better job of managing the nation’s finances than they did last time round, so everything’s bound to be fine. Just like anti-Semitism or Islamaphobia, anti-Christian persecution must be named for the evil that it is, and challenged systematically by people of faith and of no faith. Government should be doing much more to try and harness the concern, expertise and understanding of faith leaders from across the UK and beyond. So an incoming Labour government will appoint a Global Envoy for Religious Freedom, reporting directly to the Foreign Secretary. This is an issue beyond party politics, so if the Government takes this step sooner, as the Opposition, we will support them. There is no time to waste. To reinforce his position and simultaneously conduct an unapologetic piece of electioneering, he has penned an article which was published at Christian Today, entitled ‘Tackling religious persecution is a moral necessity‘. He points out that 76 per cent of the world’s population live in countries with high restrictions on religious freedom, of which the vast majority of those facing persecution are Christians, and that, according to Open Doors, 1,062 churches have been attacked in the past 12 months. 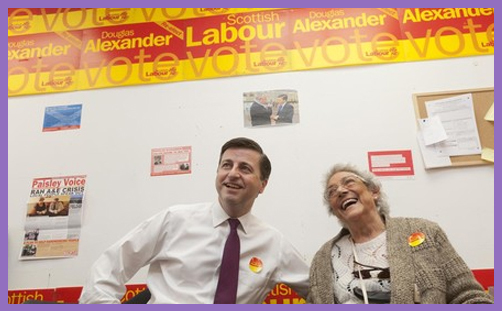 Douglas Alexander is a rare breed of politician. He is not ashamed to talk about his faith and the way it impacts his politics. Since becoming Shadow Foreign Secretary in 2011, he has criticised his own party for allowing “a misplaced sense of political correctness, or some sense of embarrassment at ‘doing God'” to hinder them in discussing any matters related to faith. His article for Christian Today is a rare example of politicians making an effort to engage directly with a Christian audience. His passion for the Government to address the matter of religious persecution has led him to speak out repeatedly through the national press. He has also worked tirelessly in conjunction with Christians on the Left to raise the profile of the suffering church within his party, which has displayed a distinct lack of interest over recent months. Labour’s Manifesto pledge to establish a Global Envoy for Religious Freedom is the crowning glory of Douglas Alexander’s political achievements. And yet it could all come to nothing. Ever since the Scottish independence referendum, the SNP have been riding high in the opinion polls. If this support continues through to election day, Labour in Scotland is facing one of the most humiliating electoral defeats in history. The predicted swing against them is huge. Back in 2010, Douglas Alexander won the seat of Paisley and Renfrewshire South with a majority of 16,614 and 59.6 per cent of the vote. This gave him the 56th safest seat in the whole of the UK. But now he finds himself embroiled in a political life-or-death struggle against a 20-year-old SNP candidate. According to an Ashcroft poll carried out in the constituency, Mhairi Black is predicted to win the seat by 8 per cent of the vote. There is a very real possibility that Labour will have a different (Shadow) Foreign Secretary in a few weeks time. For those who would rather not see Labour in government for the next five years, such a turnaround in their (mis)fortunes will stir few feelings of regret. But without Douglas Alexander at the helm, there are few (if any) who would be offered his position and want to continue to fight the cause of religious freedom. If Labour do win the election but lose Alexander, it is not unreasonable to expect that his dream of a Global Envoy and the desire for action will be quietly dropped. For all those campaigning for the protection of religious freedom, it would be a great and significant loss of a prominent and eloquent ally. Partisan politicking is intrinsic to the proper and healthy functioning of liberal democracy, but, on some issues, the just and moral vision is best realised when politicians manage to elevate themselves above that which divides them, devoting themselves instead to those crucial missions which transcend any single party. By calling for a Global Envoy for Religious Freedom, Douglas Alexander put himself in such a position, prophetically speaking out on behalf of millions of Christians who are paying a devastating price for their faith in Christ – in ways which most of us can scarcely begin to comprehend. It won’t be only the Labour Party which will suffer the loss of a dedicated and principled MP if Paisley and Renfrewshire South is turned over to the Nationalists on May 7th. The persecuted church will have lost a prophetic voice and a warrior for peace, justice and freedom.